It is a common phenomenon, the poor exterior appearance of a building or residence due to plaster damage. For most of us, the motivation to restore the exterior of a building starts mainly for aesthetic reasons. However, the care of the exterior must be a matter of particular concern to us, as it is a fundamental concern regarding the protection of the entire building or home. The best practice is to repair the damage of the wall surface, in order to protect the building as well as to prevent the escalation of the deterioration and the damage to the plaster. DUROSTICK provides you with reliable and realistic solutions for any renovation or repair need. For example, wall repair solutions using the flexible top coat plaster HYDROSTOP PLASTER ELASTIC, available in smooth and textured finish. The flexible top coat plaster HYDROSTOP PLASTER ELASTIC is used as top coat for the THERMOSEAL External Thermal Insulation System, certified first class, class 1, per ETAG 004 as, when used with ULTRACOLL THERMO, the fiber reinforced adhesive for thermal insulation slabs.. It is easy to apply on wall surfaces coated with base/scratch coat plaster, and surfaces made of concrete, bricks, cinder/cement blocks, aircrete, cement boards and drywall. It can be applied easily on painted surfaces, when the paint is in good condition and after a light sanding of the entire surface is completed. It can also be applied on wall surfaces made of wood or sheet metal, when they were previously coated with DS-260 or DS-255 quartz primer of DUROSTICK. 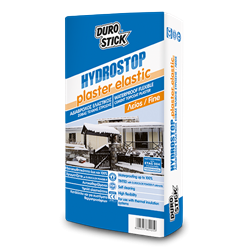 The flexible top coat plaster HYDROSTOP PLASTER ELASTIC is water repellent, self-cleaning, and its granulometry is up to 0.8mm (smooth finish). Its advanced formula contains new age elastic and water-repellent resins. 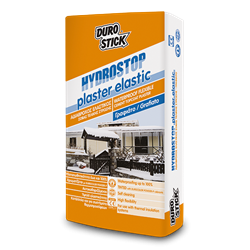 Just add water to prepare a ready-to-use plaster, suitable for interior and exterior use. Its application creates a protective coat over the entire wall surface that prevents the damaging effects of moisture, snow, frost, and intense sunlight. The product is ideal for applications where strong adhesion, flexibility, and resistance to time and moisture are a necessity. Apply it to ensure the long-term protection of the building or residence. Classified GP: CSIII/W2, per EN 998-1.